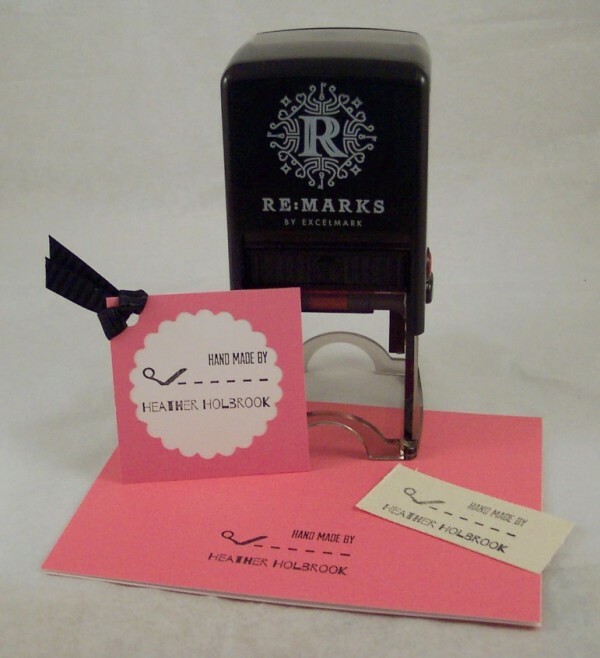 If your looking for a personalized way to add your name to the back of your hand made cards, wanting a trendy address stamp for envelopes, needing a label for home baked goodies or want to add your own monogram to just about anything then the RE:MARKS Personalized Designer Stamp may be just what you’re looking for. 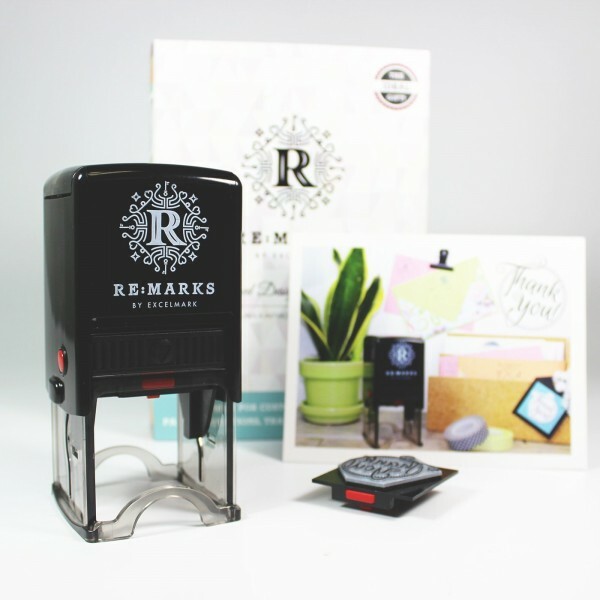 This self inking stamp has a double sided black ink pad with interchangeable stamp plates and comes with a pretty “Thank You” stamp and a certificate for a customized stamp. On-line you can choose from over 80 different stamp styles with themes like “hand made by”, “from the garden of”, “save the date”, monogram letters, “to from” gift tag, “from the kitchen of” and many different return addresses in styles that range from traditional to trendy to whimsical. When designing your stamp type in your information on-line and you’ll see a mock up of how it will look on the screen so you know exactly what you’ll be getting. The average stamp size is around 1 1/2″. I ordered my personalized stamp and it arrived within a week. I chose a fun “hand made by” stamp with scissors since I love cutting out paper, I can’t wait to stamp it onto the back of all my projects! I made a few projects with my new stamps like these two “Thank You” cards made with the stamp that comes with the RE:MARKS. They were fast and easy to make, I didn’t even need to find an ink pad since the stamp is self inking. This stamp is great for cards, gift tags or if you have your own business it’s perfect to stamp onto invoices and business cards. Next I used my personalized stamp on the back of a card, a fabric label and a hang tag. It was quick and easy to trade out the stamp plates when I wanted to swap stamps, directions are on the packaging. 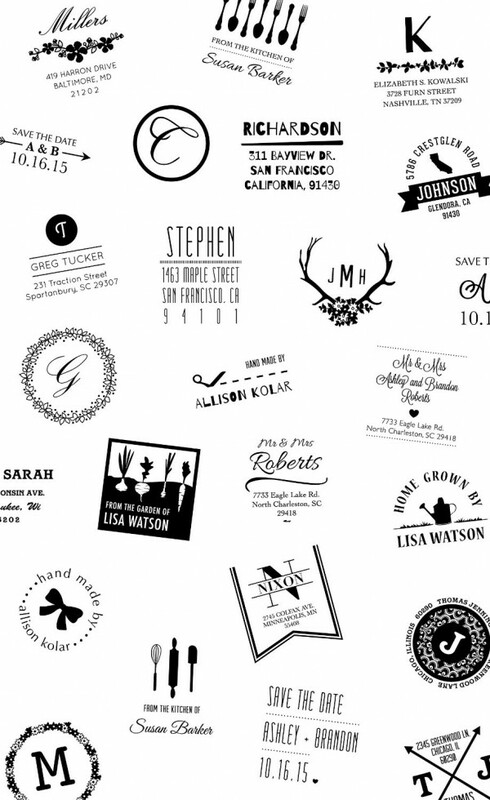 Depending on what theme stamp you chose you can stamp up canning labels, quickly return address envelopes, make price tags for craft sale items, save the date or monogram cards for a wedding, or send home grown veggies or flowers to someone with your own personalized flair. I really think the RE:MARK would also make a wonderful gift for some who has moved into a new home, newly weds or anyone you know who loves to craft, bake or garden. They’ll be able to make a customized stamp that’s just perfect for them.